Titanium. An unusual metal that owes its name to the powerful beings of Greek mythology, strong enough to challenge the Olympian gods. Titanium is the most commonly used material for the manufacture of dental implants. Not without reason – from the point of view of implantology, metal has interesting properties. First of all, its excellent mechanical properties should be mentioned – titanium is an extremely durable material, especially in relation to its relatively low weight. In addition, unlike most metals, titanium does not corrode. 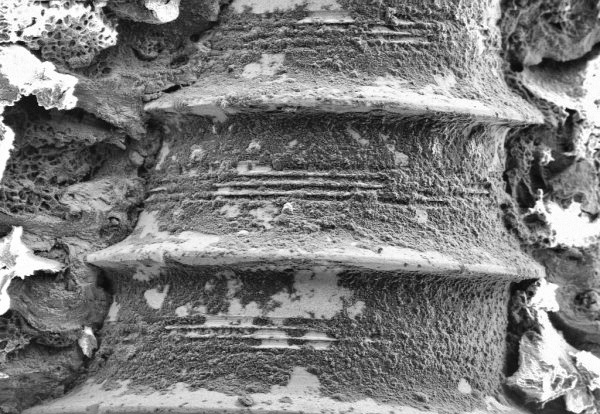 Osteointegration of the tooth implant – microscopic photo. Titanium melts at 1668 ° C, but it is formed easily and does not lose strength in this process. However, from the point of view of implantology, the other properties of this light metal make it extremely interesting. The element forms on its surface an oxide coating with a thickness of 5 to 10 nanometers, the main component of which is titanium dioxide (TiO2). It is this layer that makes bone tissue easily adhering to the surface of the implant, gradually undergoing mineralization processes. In addition, the outer shell of the implant is coated with plasma proteins (fibronectin, victronectin), whose task is to provide the implant with a sufficiently high level of biocompatibility. The idea is that the natural healing processes proceed as quickly and efficiently as in the case of tissue not burdened by the presence of a foreign body. A good implant should integrate with the bone with the possible minimal bone resorption response. The healing process of tissues at the interface with the surface of the implant is in fact a complex interaction between the newly formed bone callus and the surface layers of titanium dioxide. Its success depends to a large extent on the thickness and chemical composition of the oxide layer on the implant surface. It is known that the presence of undesirable factors may interfere with the formation and reconstruction of the bones, which in turn results in the failure of the entire osseointegration process. For this reason, it is fundamental to properly prepare the surface of the implant and maintain its complete sterility. Once the implant is implanted, physical factors such as the size, shape or roughness of the implant surface also affect the speed of healing processes. Osteointegration depends to a large extent on the regenerative capacity of the body itself. Even the most biocompatible implant will fail the test if the surgery itself was carried out in violation of the procedures. The point is to avoid excessive increase in tissue temperature during bone preparation, which in turn increases the likelihood of a proper healing response. The smaller the clot and inflammation of the periosteum, the greater the capacity of the tissues to differentiate. The key is also an adequate blood supply, ensuring the growth and mineralization of the callus. Hypoxia stimulates the undesirable growth of fibrous and cartilaginous tissue cells. Soon after the implant is implanted, about half a millimeter layer of dying bone tissue appears. In its place the body will create a new bone callus, through the process of developing vascular bundles (at a rate of 0.5 mm per day). The network of bone tissue around the implant will be formed for approximately 2 weeks after implantation. bone callus is also synthesized thanks to the neutral oxide surface of the implant. After completion of the first stage of regrowth, a regeneration time begins, in which osteoclasts initiate the process of resorption of the callus network at a rate of about 40 micrometers per day. Behind the resorption areas appears a layer of diverse bone plates. The final stage is overgrowing the space around the implant with a new bone tissue in a process called repair osteogenesis, which results in the clinical fixing of the implant.